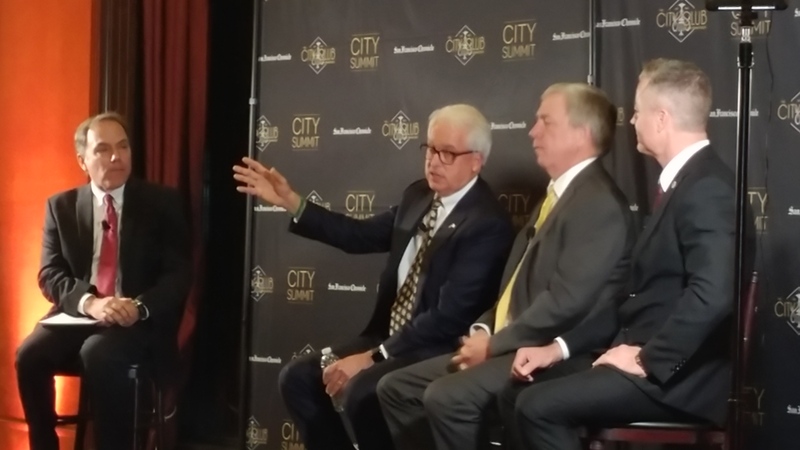 Republican candidates in San Francisco, from left to right, John Cox, Doug Ose and Travis Allen. (NICK CAHILL, Courthouse News Service). (CN) — Juggling climate change, environmental policy and California’s mounting housing crisis, candidates jostling to replace Governor Jerry Brown on Tuesday detailed their fixes for the nation’s most populous state. From a posh social club in San Francisco, the leading Republican candidates blamed California’s bedrock environmental law for the state’s housing shortage, sounding off ways to amend the California Environmental Quality Act. The Republican frontrunner, Orange County Assemblyman Travis Allen, called CEQA a “weapon” labor unions use to stunt and freeze building projects across California. He said he would change the landmark protocol enacted in 1970 by eliminating red tape and punish litigants for filing frivolous CEQA lawsuits. “As the next governor of the state of California, I will unleash a housing boom the likes that this state has never seen,” Allen, 55, promised. San Diego-area businessman John Cox claimed to be the first candidate to call for reform or replacement of CEQA, which requires developers and state agencies to prepare environmental impact reports and other protocol before construction. Former three-term Congressman Doug Ose, a Sacramento-area developer, touted his experience with CEQA, saying that while it has flaws, attacking or tearing it up would be a “recipe for disaster” with voters. Sharing a debate stage for the first time, the Republicans predictably agreed on supporting President Donald Trump, doubting climate change and their eagerness to replace California’s new gas-tax increase. The forum moderated by San Francisco Chronicle editor John Diaz was highlighted by jabs between Allen and Ose. With Trumpian braggadocio, Allen called himself the favorite to beat Democrat Lieutenant Governor Gavin Newsom, who holds a decided fundraising edge over all of the candidates. “I have never lost an election; these two candidates here are three-time losers,” Allen falsely claimed of Ose, but not of Cox, drawing laughs from the intimate gathering on the 11th floor of the Stock Exchange Tower. Ose, 62, fired back by citing recent reports that Allen is among state lawmakers named in “substantiated” harassment claims released by the Legislature. The rivals argued about who was first to support candidate Donald Trump. Cox, 62, reassured the crowd that while he didn’t vote for Trump he now supports the president. Diaz interrupted, joking that the trio had just made San Francisco history by arguing who most supports Trump. Simultaneously, 400 miles to the south in Los Angeles at a more subdued forum, the Democratic candidates minus Newsom presented their roadmaps for creating green jobs and preventing or mitigating environmental disaster. State Treasurer John Chiang said holding government agencies accountable through audits will ensure that the Environmental Protection Agency can clean up toxic chemicals in low-income communities, such as the effort to reinvigorate a closed Exide Technologies plant in nearby Vernon. “I want to make sure our agencies are doing the right thing,” said Chiang. “That includes spending their resources wisely.” Chiang, 55, emphasized his fiscal experience and vision for the state. Antonio Villaraigosa, mayor of Los Angeles from 2005 to 2013, said his track record on environmental conservation and technologies speaks for itself. 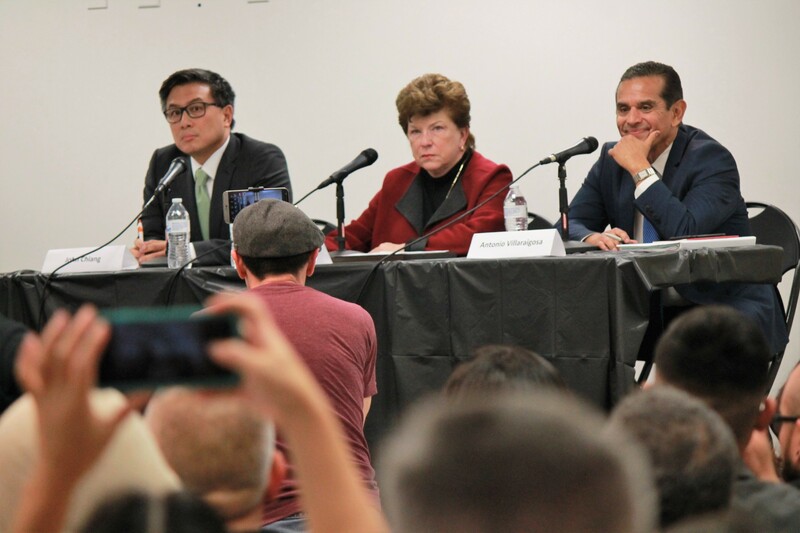 “We were focused on meeting goals before people started to set them up,” said Villaraigosa, 65, who cited his eight years as mayor throughout the forum. Villaraigosa, who was second to Newsom with 17 percent of likely voters in a recent statewide poll, said he would support a proposed large aquifer project in the Mojave Desert. Delaine Eastin, former state superintendent of public instruction, said the path to creating more jobs is through educational reform. Eastin, 70, called for tuition-free college and garnered applause when she said, “Read my lips: Repeal Costa Hawkins,” a housing act that limits rent control across the state. The candidates’ environmental message resonated with the Southern California audience. Virginia Valverde, 72, of Los Angeles, says she hopes that 2018 is the year of change for the country, not just a new governor, but for politics in general. She appreciated Chiang’s performance and waited in line to shake his hand. “I do think California will have to be the leader for environmental change,” Valverde said. The top two finishers in the June primary will advance to a November runoff. Newsom leads early polls with 26 percent of likely voters, Villaraigosa at 17 percent, and Allen and Cox each pulling in 9 percent. Ose entered the race in January, after the last statewide poll. San Francisco Bay Area businessman and 2018 Republican U.S. Senate candidate Paul Taylor said he’s still undecided but that Ose was impressive. “I think Ose has the highest IQ,” Taylor said.